The Enterprise Marketer Podcast is based on the live shows we record at marketing events around the United States. Social Media - What’s Happening at the Enterprise Marketer Conference? SEO & Data - What’s New in the Orbit Media 2018 Blogging Research? Marketer-to-Marketer - What's Next for Video Marketing? Welcome to Season Two - What's Next for Video Marketing? This is the podcast home of the Community Call for EnterpriseMarketer.com. Scheduled regularly, this call is a way for those who are a part of the community to hear about what content is being produced, features added to the site, and ways you can participate. Text MARKETER to 66866 to join the newsletter and get the details you need ... Maggiori informazioni for the next call. Hosted by Jeff Julian, this podcast drives a deeper level of conversation in marketing through the interviews of experts in the field. 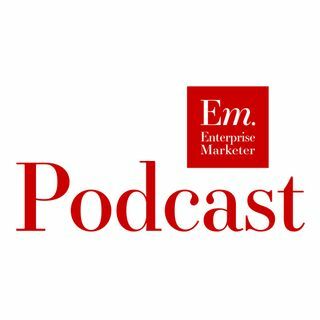 This edition of the Enterprise Marketer Podcast is based on the live shows we record at marketing events around the United States. A video and audio series to help marketing teams grow through unscripted conversations between today's most influential marketing practitioners and thought leaders.